Wendell Dayton and Hei Myung Hyun create unprepossessing works that steal upon the eye in various irruptions of the visual field, a little here, a little something there. Dayton’s sculptures might be just careless attempts at making a jungle gym, small flat planes irregularly-shaped in dully-burnished stainless steel à la Smith, attached to a ligature of pipes or beams flexed or off-kilter. You walk around Untitled No. 10, and suddenly the round O of the painter stares from an extension that disappears as you continue. The leaf shapes or cutouts seem cursory or minimal, the cuttings show the art. Dayton burnishes out to the line, a most delicately carven thing like a pencil line. 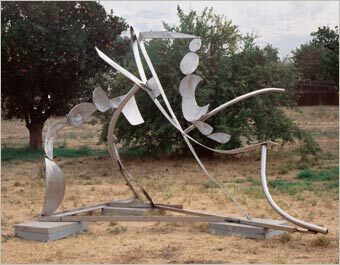 You see his angles, he’s made abstract steel sculpture like grasses and leaves with stalks, palmy moon and flowers, stern hard things that catch the subtlest movement of the eye in nature. Hyun has a basis in calligraphic paintings of bamboo, overlaid with planes of paint and imagery in static levels of application that won’t hold the surface. It evaporates before your eyes (which have no sure hold but the bamboo more or less discernible) as the planes dislocate in ranges of depth, like sitting on tatami in your paper house with its various articles. The precise calculations of minutely-organized paint figurations are maddening to contemplate in themselves (bird outlines, dots) except as tenuous imagery or color on the threshold of perception, and the eye freely moves in or out of the painting, amongst its occurrences. Wendell Dayton, Beverly Pepper, George Rickey, Richard Serra and David Smith make steel sculptures that express the perceptions of the sculptor’s art in the highest degree, almost miraculously. 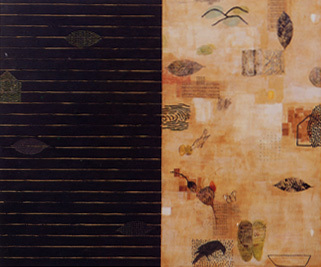 Hei Myung Hyun, like Johns or Klee, lets the eye move about its limits to see with its mind.